Spectacularly rapid full body documentation with FotoFinder. The skin is an extremely large organ that takes a long time to examine. 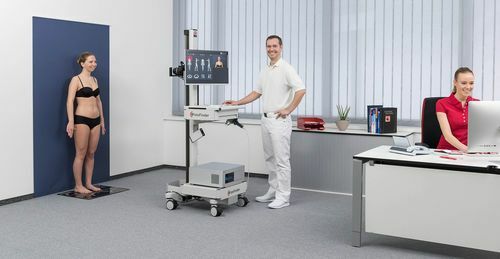 The new bodystudio ATBM® procedure revolutionizes comprehensive skin cancer screening: the software-assisted capture process and the fully automatic camera positioning reduce the procedure to a minimum of time. With the help of SmartMatch technology, the system generates a brilliant overview image of up to 72 megapixels from every side of the body. Once the follow-up photographs have been saved, the new Bodyscan ATBM has already compared them with the images from the previous examination and helps you to see changes at a glance. • Unique fusion of total body photography and dermoscopy. • The intuitive and simple procedure can be perfectly delegated to an assistant.